Mr Jammeh, who took power in a coup in 1994, was defeated by Adama Barrow, who won more than 43% of the vote. Mr Barrow accused the incumbent of damaging democracy by refusing to accept the result. His transition team said the president-elect was safe. International criticism of Mr Jammeh came swiftly. The US and The Gambia's neighbour, Senegal condemned his announcement, and the African Union called for a "peaceful and orderly transition of power". The results were revised by the country's electoral commission on 5 December, when it emerged that the ballots for one area were added incorrectly, swelling Mr Barrow's vote. The error, which also added votes to the other candidates, "has not changed the status quo" of the result, the commission said. However, it narrowed Mr Barrow's margin of victory from 9% to 4%. Mr Jammeh said that he now rejected the results of the election "in totality". 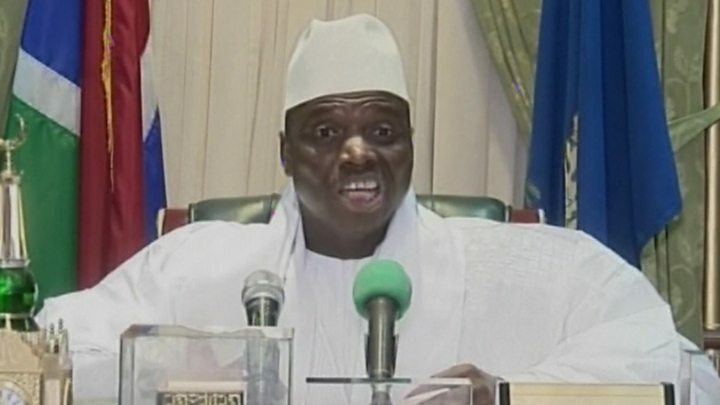 "After a thorough investigation, I have decided to reject the outcome of the recent election," Mr Jammeh said. "I lament serious and unacceptable abnormalities which have reportedly transpired during the electoral process. "I recommend fresh and transparent elections which will be officiated by a God-fearing and independent electoral commission." Mr Barrow's spokesperson said the head of the army, General Ousman Badjie, supported the president-elect, having pledged his allegiance after the initial result. 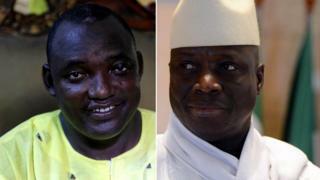 The BBC's West Africa correspondent, Thomas Fessy, says the main question now is whether the Gambian leader has managed to split the army, retaining a faction ready to back his announcement. The government in Senegal called for an emergency meeting of the UN Security Council. Foreign Minister Mankeur Ndiaye, speaking on national television, urged President Jammeh to respect the election result. The US has "strongly condemned" Mr Jammeh's rejection of the result. "This action is a reprehensible and unacceptable breach of faith with the people of The Gambia and an egregious attempt to undermine a credible election process and remain in power illegitimately," said state department spokesman Mark Toner. A Human Rights Watch spokesman also said it was "deeply concerned". "The international community, notably [regional bloc] Ecowas and the African Union, should loudly protest any unlawful attempt to subvert the will of the Gambian people," said Babatunde Olugboji, deputy programme director. The streets of the capital, Banjul, were reported to be calm on Friday night although soldiers were seen placing sandbags in strategic locations across the city, AFP news agency reports. Only last week, Mr Jammeh was shown on state TV calling Mr Barrow to wish him well. "You are the elected president of The Gambia, and I wish you all the best. I have no ill will," he said at the time. In his 22 years in power, Mr Jammeh acquired a reputation as a ruthless leader. Ahead of the election, Human Rights Watch accused him of using violence to silence critics. The group said two activists had died in custody and dozens of people had been jailed and denied medical or legal help.